This sign is located at N41 51.630 W81 57.011. 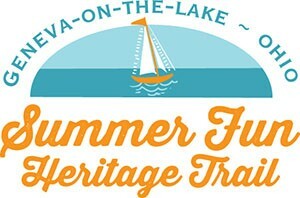 “Warner” and “Geneva-on-the-Lake” go together like French fries and ketchup. 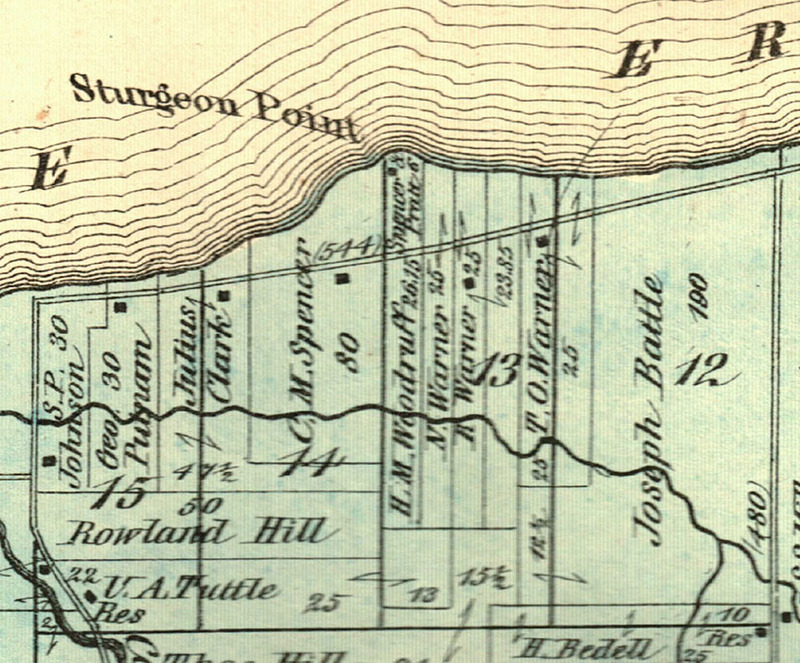 An 1873 map shows the Warner family’s holdings in the area of Sturgeon Point, where the resort got its start just four years earlier. The Warners had three children: Truman, Abigail and Nelson. Nelson married Laura Sullivan and they had five children. Like his parents, the couple lived in a log cabin for a number of years. 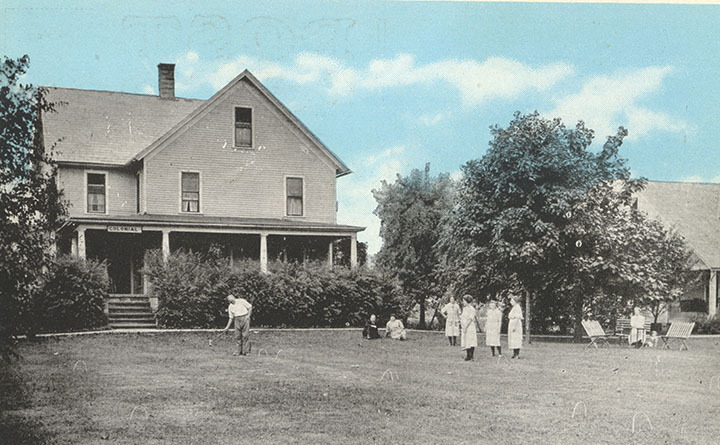 They eventually built a four-room, frame farmhouse and, in 1887, opened Orchard House to the first summer boarders at Geneva-on-the-Lake. Up to that point, the resort had not offered overnight accommodations, except for camping, and at the Warren E. Spencer “Rose Cottage,” later Pennsylvania Lodge. The Colonial Cottage was the four-room farmhouse that Nelson and Laura Warner built on their Geneva Township land. It later became known as the Hotel Colonial. From the David Tobias postcard collection. The coming of the Nickel Plate railroad to Ashtabula County in 1882 was a significant factor in the resort town’s development. Guests could travel from both east and west points on the railroad, which had a station in Geneva. Nelson Warner owned a horse and surrey, which he would use to transport guests from the train station to Warner’s boardinghouse. Mrs. Warner greeted the guests from the porch and offered them lemonade. Many of these guests would stay for the entire summer. One of their sons, Charles, stayed on the old Warner acreage after marrying Myrtle Butler in 1902. The couple looked after Nelson and Laura until their deaths. The lakefront property owned by the Warners was split between the two living sisters and Charles’ brother. Charles was a tireless promoter of the resort and was instrumental in bringing electricity, city water and sewer and the golf course to the village. The center of the golf course is land donated from the Warner farm. He pushed for incorporation of the village and in 1928, Charles Warner became the first Mayor of GOTL. He also served as president of the area school board and helped design and build the Spencer School Building (no longer standing). He also oversaw the first power plant at GOTL and was a director of the Lake Shore Water Co. His hobbies included a magnificent flower garden and apple orchard. He also made maple syrup, and he suffered his fatal heart attack while tapping the trees in his sugar bush. The Warners’ son, Howard Tye, followed his father as mayor. Howard became a lawyer and began practicing law in October 1930. He was the first judge of the County Court of Ashtabula County; indeed, Warner helped the Ohio Legislature create these courts to eliminate the former justice of the peace system. Howard and his wife Katherine Horner had two children, Joann and Charla. For many years, the family and grandchildren spent their summers enjoying the lakefront from the land Reuben and Maria had purchased more than a century prior. The Warners’ holdings at the resort included the Homestead, a boardinghouse that Tomas “Uncle Tom” Kainaroi, purchased from Reuben Warner’s granddaughter. Kainaroi converted the house to a summer home and office for his cottage business. 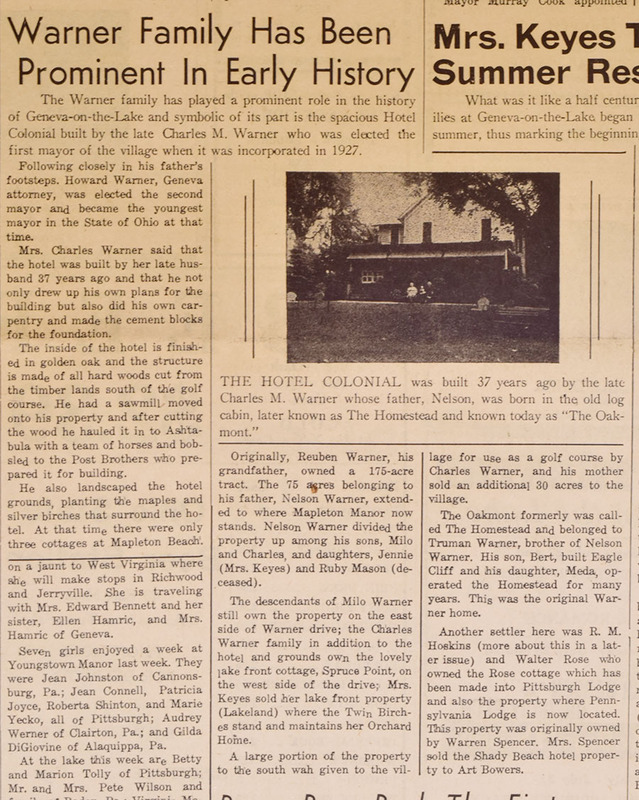 The Colonial, although no longer under Warner ownership, continues to serve the tourists who come to Geneva-on-the-Lake for relaxation and fun. It is owned by P.J.Macchia, whose late father, Pete, purchased and converted to various uses. Under P.J.’s ownership, the house was returned to the tourist trade and is rented by the week. Further reading, The Beachcomber, July 28, 1947.